Tokyo is moving on several fronts as it seeks to smooth over last month’s Kono Statement review. The last week has brought several examples of Japanese efforts to improve ties with South Korea, as well as Seoul’s reluctant opening to some of these gestures. Chief among them are the current visit by Tokyo’s governor to Seoul and the resumption of high-level bilateral talks on the “comfort women” issue. Neither country has an interest in letting their relationship slide further into disrepair, particularly with both showing weakening economic figures. These latest attempts will help gauge how serious both countries are about returning to a more normalized footing. Japanese Prime Minister Shinzo Abe got the ball rolling last Thursday when he met with Korean journalists in Tokyo and called for both to put aside their differences, according to the Chosun Ilsbo. He said “The two countries respect freedom, democracy, human rights, and rule of law, and share mutual strategic national interests. Therefore the bilateral relationship between Korea and Japan must be further developed.” Abe is also reportedly interested in a formal summit with South Korean President Park Geun-hye, although so far she has not agreed to anything definite. Last Friday South Korea also agreed to resume monthly director-general level talks with Japan over the comfort women issue. The meeting on Wednesday was just the third since the talks started, as Seoul withdrew from the talks last month due to Japan’s review of the 1994 Kono Statement, which apologized for Japan’s atrocities during the Second World War. While the review upheld the apology, it questioned the testimony of the Korean women as lacking corroborative evidence. The two countries’ officials are also expected to discuss the possibility of their foreign ministers holding a sideline meeting at the ASEAN Regional Forum (ARF) next month in Myanmar. These talks will be important as political ties often facilitate economic ties. 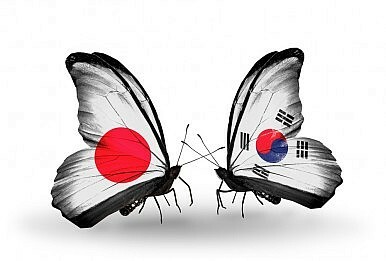 With South Korea’s economy growing at its slowest pace in seven quarters, and Japan cutting its growth forecast for the fiscal year to 1.2 percent due to rising energy imports and sluggish exports, both have an incentive to improve relations. Japan will also be seeking to repair ties in the wake of Chinese President Xi Jinping’s visit to South Korea. Whether this week’s meetings lead to more substantial talks between their foreign ministers and heads of government later this year remains to be seen, but for now both appear to be putting themselves on that course.